Selected from manuscripts submitted for individual critique at the recent #LA12SCBWI, the Sue Alexander Most Promising New Work Award is given to the manuscript deemed most promising for publication. Critiquers at the Los Angeles conference determine the finalists. Until her sudden death in July 2008, Ms. Alexander made the final selection. Now, a three-member panel from Sue's writing group of 20 years makes a final selection after the conference. The winner receives an expense-paid trip to New York to meet with interested editors. Lee: Tell me about finding out that your manuscript was first nominated and then WON the Sue Alexander Most Promising New Work Award! Kat: It was pretty surreal. I had first intended to submit a MG for critique at the LA conference. It was something I had written last year during NANOWRIMO. But for some reason, the voice just wasn't resonating with me. I wasn't Feeling It (if you know what I mean.) At the last minute, I decided to have a new YA critiqued, GIRL OF SHADOW. It was a work in progress and, even though I knew the whole story, it wasn't close to being finished. But I was Feeling It. I decided that I should have it critiqued to see if I was just talking to myself - or if my critiquer would Feel It too. The first day of the conference, I found out that I was lucky enough to have Josh Adams, of Adams Literary, for my critique. He represents friends of mine and I knew he was a terrific agent with an amazing track record, so I was excited. Josh was so great and supportive. Right away, he let me know how much he liked it and that he was nominating me for Sue Alexander. The funny thing is that when I was nominated last year - I kinda kept thinking that I just might win (which I didn't). But this year, it didn't seem likely to me. It was just a work in progress with a good start. That was all. 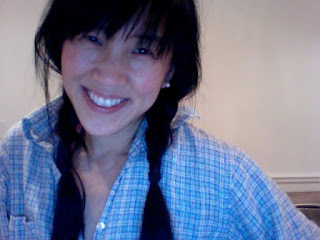 I was happy - but mostly because I felt that I had gotten reinforcement that I was on the right track. So I was able to relax and not think about it. When I got the call, I was actually screening. I had been getting sales calls all morning and I really wanted to get work done. Then I heard this sweet voice on the answering machine say something about Sue Alexander. Of course I ran to grab it - and when they told me I won, I started jumping up and down and babbling. My daughter was home and we just kept laughing and jumping. Lee: Aww, that's so sweet! So, have you been writing furiously to finish GIRL OF SHADOW? Kat: Yes! Actually I've been writing furiously on several different project right now -though furious usually isn't my style. Lee: So you win (in addition to all the attention and the huge vote of confidence) a trip to the New York SCBWI winter conference. Have you figured out your plans yet? Kat: I'm already in New York, so I was planning on attending the SCBWI Winter Conference anyway. It's a such a great conference and the keynotes are always inspiring and weep-inducing. Right before I won Sue Alexander, I had been working on final revisions for a MG, getting ready to submit to agents. So a lot of things started happening at the same time. But now the agent process is just about finished and I'm very excited that I will be making an announcement soon. With that in mind, I guess The Plan is to keep working on GIRL OF SHADOW - as well as my other projects. Just keep trying to get them all to that next level. Lee: Well we're very excited for you and will be cheering you on! Thanks, Kat! Kat: Thanks, Lee :) See you in New York! There were also three honorees, Karen Bonner for "Oakatee," Barbara Herkert for "Sewing Stories: The Life of Harriet Powers," and Allison Crotzer Kimmel for "Toots." Additionally, Jenni Bielicki won most promising picture book for "Starry Kalahari." Every industry has its own jargon, and it's important to know ours. Want to better understand royalties (both "on list" and "on net") and earning out? What's meant when an editor says they're looking for a "high concept" picture book? What's expected on a one-sheet? What's a lay-down date? What's behind the term "picture story book?" 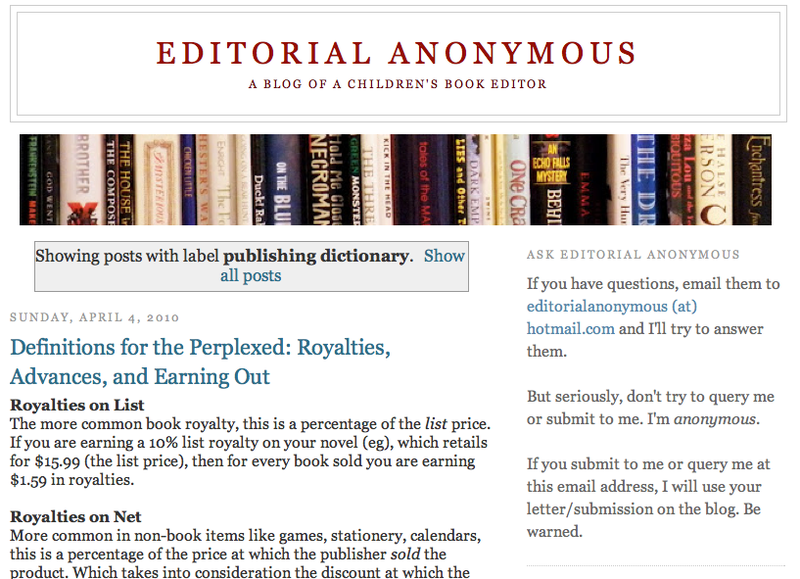 And if you want to snort water (or whatever else you happen to be drinking) out your nose, check out Editorial Anonymous' take on the term "pre-published." 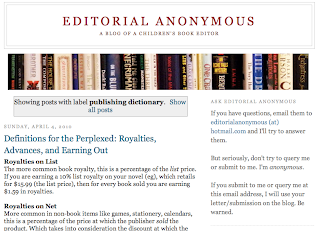 Editorial Anonymous' Publishing Dictionary posts are a great resource. At least one third of "consumer" reviews of books and other products found on the internet are fake. The fake reviews are written by marketers, retailers, authors, friends of the sellers, and even third-party companies paid to churn out positive reviews. "Twenty percent of Amazon’s top-selling e-books are self-published. They do not get to the top without adulation, lots and lots of it." "One of Mr. Rutherford’s clients, who confidently commissioned hundreds of reviews and didn’t even require them to be favorable, subsequently became a best seller. This is proof, Mr. Rutherford said, that his notion was correct. Attention, despite being contrived, draws more attention." "Amazon and other e-commerce sites have policies against paying for reviews. But Mr. Rutherford did not spend much time worrying about that. “I was just a pure capitalist,” he said. Amazon declined to comment." 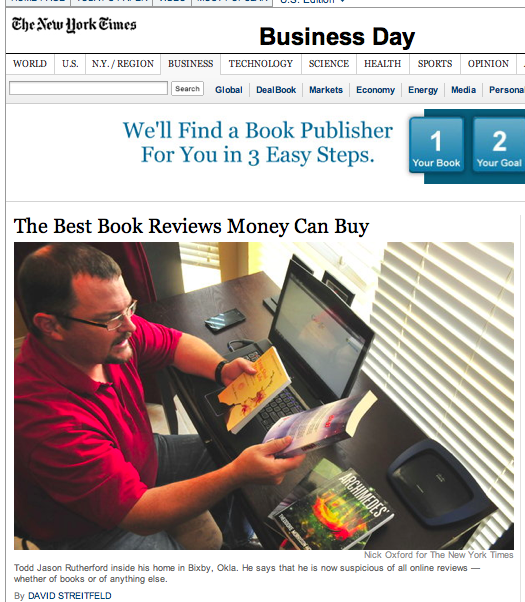 "for $99, he blogs and tweets about a book — he has 33,000 Twitter followers"
You can read the full article by David Streitfeld, "The Best Book Reviews Money Can Buy" here. This brings up a really important issue about where the ethical line is and should be drawn. Should "consumer" reviews on sites like Amazon and Goodreads be from people the author and illustrator don't know? Should all reviews have disclaimers on the connection of the reviewer to the author/illustrator? How can the system be more honest? If paying for favorable reviews is going too far, what about asking a friend to write a review of your book? Recently, a publicist at a publishing house contacted a blogger who had reviewed a book they'd put out... requesting that blogger re-post their review as a consumer review on Amazon. Is that too far? Where do you draw the line? Tell us in comments! We each need to consider the answer for ourselves... and our industry. This is a fascinating presentation about creativity and how to relate to our own creative process. It's well worth the 20 minutes to watch for everyone doing creative work - and that certainly includes us, the writers and illustrators of books and creative content for children and teens! 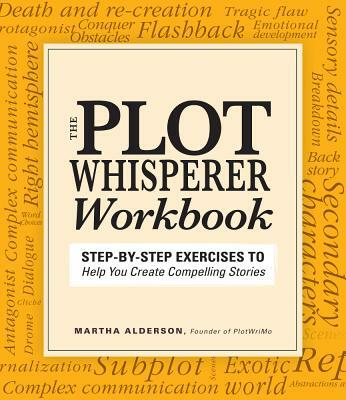 Martha Alderson has a series of 27 videos on YouTube that walk writers through the steps of plotting our stories. Each video explains what you need to do, and then gives a bunch of examples to illustrate her points. They are a wonderful resource. Martha's latest book, The Plot Whisperer Workbook, has just been released. Thanks to literary agent Jill Corcoran for letting me know about Martha and her books and videos on plot! KidLitCon is the annual conference for people who blog about children's literature. This year the conference will be held on September 28 and 29 at the main branch of the New York Public Library in New York city, and it's being put together by School Library Journal Fuse #8 blogger Elizabeth Bird, who is also an author and the New York Public Library's Youth Materials Collections Specialist. Lee: Hi Greg! Tell us about Kidlitcon! Greg: Hi Lee! It's a great conference (now in its 6th year) about blogging and children's literature. But it's also about social media, books, writing, book reviewing, promotion, libraries, and much more... all with a children's and YA lit focus. Lee: I saw on the schedule that Maureen Johnson will be giving the closing Keynote! Lee: For authors and illustrators of books for kids, it sounds like there's a lot of sessions focused on platform, marketing and the benefits of being an online presence. Greg: There are, indeed. And I think the panels on book reviewing - why bloggers do it, how they do it, how they want (or don't) to interact with authors and illustrators - are really valuable, too. Lee: I thought the title of your session was really intriguing: Avoiding the Echo Chamber. Tell us more about what you're going to address. Greg: I love folks in children's literature. A lot. I'm flying to New York to hang out with some, in fact. That said, when we're talking about "spreading the word" about books, whether our own or children's literature related in general, I often feel that we spend a lot of time preaching to the converted and not much time talking to the rest of the world. And I think that's a missed opportunity online. Folks are many things - that standup comedian or social media strategist online is also very likely a parent or aunt or uncle or or or. They can become champions and word-spreaders and buyers. But not if we don't include them in the conversation. Greg: I will! And they are magical secrets! Or, really, some basic ways of thinking about what we do online as well as tips and ideas and actions to take. Lee: Love leaving a session with a plan of action! Any more thoughts to share about KidLitCon? Lee: The day does end with a New York City kid lit drink night! Lee: Have a great time, and thanks for telling us about Kidlitcon 2012! Greg: Thanks for asking, Lee! You can find out more about KidLitCon 2012 here. 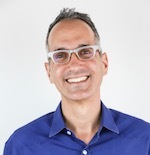 Greg Pincus blogs about children's literature and poetry at GottaBook and social media at The Happy Accident. He is the author of a poetry collection, The Late Bird, and his debut novel, The 14 Fabulous Fibs of Gregory K., is due out from Arthur A. Levine Books. And here's Maureen Johnson's twitter feed. Lee Wind: Hi Lee, congratulations! Tell us about your book, please. We adopted the striped Tabby with an orange tummy, and brought him home – where he skittered under a bed and hid for two days. Patterson lured him out at last by dangling a shell lei. We named him Papaya. As the weeks passed, Papaya and Patterson became comrades-in-paws – snuggling together under blankets, reading together, playing “Chase the Ping-Pong Ball”, even lapping out of the same cereal bowl – and I had a great idea for a new picture book. But how best to tell the story of a boy, a cat and their growing friendship? At first, I tried traditional prose – too humdrum. Then I tried rhyme. That felt forced, too cutesy, and too young: I wanted this book to appeal to all ages. Lee Wind: How long have you been involved in SCBWI, and can you share what you feel you’ve gained by being a member? Wow - excellent! And she even ended it with a cat emoticon! Lee Wind: Hi, Eugene, congratulations! Can you tell us about the book from your point of view? Eugene: Won Ton is about tension between the tough and proud stance and the longing of a lonely heart. Lee Wind: That sounds like poetry, too! Can you share with us what being a member of SCBWI has meant for you? Eugene: SCBWI turns you from the outsider into the insider, welcomes you into the community of like-minded artists, and gives you the tools to learn (if you keep your eyes peeled). In 2006 Tomie DePaola chose me to receive his most generous award at the Winter Conference in New York and that gave me confidence to pursue the book making in earnest. Lee: I love those SCBWI success stories! Do you have any advice to share with other children's book writers and illustrators? Eugene: Look within yourself for the stories to tell, learn to steal from the right people, and tell the truth. Ha! Funny and profound. And I love hearing those two descriptions of the same book. The SCBWI Central-Coastal California region (formerly known as the Ventura/Santa Barbara region), is small but incredibly active. We run three “big” events including an annual Writers’ Day, a Retreat and a bi-annual ArtWorks intensive for illustrators. We also offer smaller events in each of our four counties (Ventura, Santa Barbara, San Luis Obispo and Kern) including workshops, critiquenics and illustrator gatherings. Our listserv is known for lively discussions about the art and craft of writing for children, monthly book talks and updates on market information. 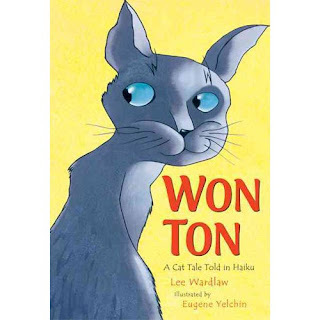 Members in the Central-Coastal California region are absolutely thrilled that WON TON: A CAT TALE TOLD IN HAIKU won the Crystal Kite Award in the California/Hawaii Division! And we're especially proud that Lee Wardlaw, Eugene Yelchin and their editor, Sally Doherty of Henry Holt spoke at our Writers' Day event in 2011 and walked us through the fascinating process of this book's development. We’re very excited that she will be accepting her Crystal Kite at our CenCal Writers’ Day on October 27, 2012.-- a lovely full-circle experience for all of our members who have been cheering this book on from the start. In addition to being a terrific writer, Lee, a resident of Santa Barbara and an SCBWI member since 1983, has been an incredible support to writers through the years, generous with her advice, time and talents. She helped plan several regional events during my own transition into the position as regional advisor in the1990s and continues to be a respected voice on our regional listserv. -Alexis O'Neill, Regional Advisor for Lee Wardlaw's SCBWI Central-Coastal California region. In a lovely coincidence, I am the co-Regional Advisor, along with Sarah Laurenson, for the SCBWI Los Angeles region, and we're delighted to celebrate our member, Eugene's, success! 2. Illustrator's Day - This year on November 3rd - a one-day conference featuring speakers (editors, art directors, and illustrators), juried art competition, contests, and portfolio reviews/display. Details here! 3. Writer's Days - Spring - a two-day conference featuring speakers, a professional forum, writing contests, and awards. The first day focuses on speakers exploring an issue in depth (Diversity is the theme for 2013), the second day offers intensive sessions with the conference faculty. 4. Creative Toolbox - A one day workshop featuring a speaker demonstrating nuts and bolts techniques on the craft of writing and illustrating for children. 5. Critiquenic - Summer - free, informal critiquing sessions for writers and illustrators facilitated by published authors/illustrators, held after a picnic lunch. 6. Down the Rabbit Hole Field Trip - a hands-on creative field trip for writers and illustrators. To find out more about Lee Wardlaw, visit her website here. For more of Eugene Yelchin (he's a writer and an illustrator!) visit his site, here. To find out more about SCBWI Central-Coastal California, check out their region's website. And to learn more about SCBWI Los Angeles, here's the link. My thanks to Alexis, and Cheers to both Lee Wardlaw and Eugene Yelchin on winning the Crystal Kite Member Choice Award for WON TON: A CAT TALE TOLD IN HAIKU! Running September 4-7, 2012, this year's Random Acts of Publicity event is designed to take the focus off you and your books for a week and instead focus on a friend’s book or a favorite book. How can you help that book’s sales? The brain child of Darcy Pattison, Random Acts of Publicity asks each of us to Blog, link, Like, review, or talk about a friend's book. Or as Darcy likes to put it: BLLuRT it Out! What are the talking points of the book you want to feature? How can you start a conversation? Are there behind-the-scenes stories that make the book sound more interesting? Do different audiences require different talking points and different conversations? How do you create online conversations? And how often do we start in-person conversations about a book? Let's TALK about Talking about Books this week. In conjunction with the event, there's a contest where Susan Raab of Raab Associates is offering 10 free marking consults. The catch? You can't enter. You can only enter a friend's name! See the posting on the Facebook Random Acts of Publicity Event page on September 6 for full contest details--you'll have 24 hours to enter. and see what you learn from the experience that you can apply to promoting your own work! For more about Random Acts of Publicity, check out the FAQ at Darcy's blog and the facebook Random Acts of Publicity event page!